One thing is for sure, girls are dating older guys much more so now than ever before thus shunning what society and the gossipers think. Just think I moved to Atlanta GA for employment and a better lifestyle. However, I found the social aspects of my life took a downhill spiral. I dated boys instead of men. I looked at myself and realized I was moving backwards. What’s driving these relationships lopsided by age? Is there an element of perversion? An aligning of planets given that girls mature faster than boys? Or is this trend fueled by one’s instinct to nurture or be nurtured? Are there simply more benefits dating someone much older. Why more younger women like Donna Marie are falling into the arms of older guys. When a young woman starts entertaining these thoughts, seldom will she find a man her own age who hears the same little voice as she does. Men are wired differently – as if you didn’t already know. And this is why single older guys are an appealing proposition – they too hear that same little voice inside their head. His days of partying have come to a close, he’s experienced with women and has been around the block enough times to know what most woman want. 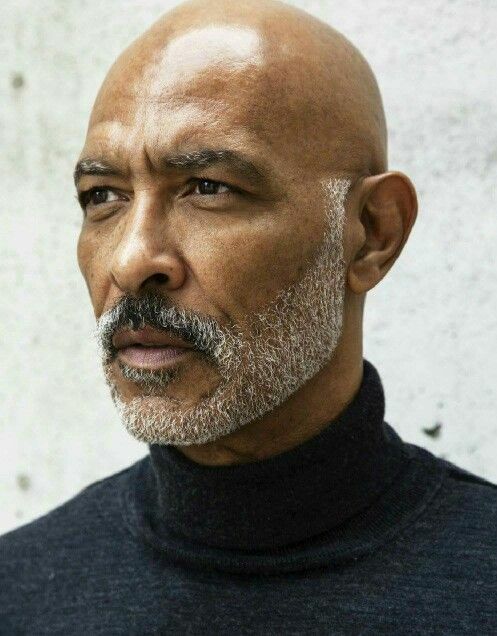 A guy who is older provides security, is ready to have a young vibrant, intelligent mate he is less likely to be a player, is far more adept in communication and is financially motivated to provide a loving and safe environment for his beautiful younger lady and family. In 2013 about 48% of Black men 25 and older attended college although half of them did not complete a degree compared to 58% of ‘all men’ who attended college who just under half have no degree (see chart below). The biggest disparity between Black men and ‘all men’ in America is with those who have a bachelor’s degree. Only 17% of Black men have a bachelor’s degree compared to 30% of ‘all men’. Second is the number of Black men who finished high school but did not pursue higher education, 35% compared to 28% of ‘all men’. The percent of Black men who have an associate’s degree (7%) is equal to that of ‘all men’ (7%) in America (see above table). Only 18% of Black men over 25 did not complete high school. This is still higher than the percent for men of all races and ethnic groups together. The 37% of African American males who worked full time all year in 2013 had median earnings of $37,290 in 2013 compared to $48,099 for ‘all men’ (above table). Of Black males ages 16 to 64 years old, 40% had no earningsin 2013 which was higher than the 30% with no earnings of ‘all men’ in the same age group. Also a larger percentage of Black males 16 to 64 were unemployed than for ‘all men’ (11.2% compared to 7.3%) and were living below the poverty level (26%) than ‘all men’ (15%). The percentages of Black men who are married and who have never been married are almost the exact opposite of those percentages for ‘all men’ in America (chart). Although 51% of Black men have NEVER been married 50% of ‘all men’ are currently married. 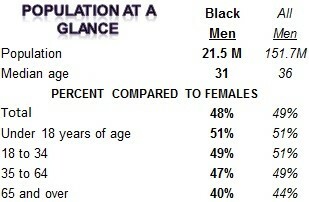 Only 32% of Black men are currently married while only 36% of ‘all men’ in America have NEVER been married. 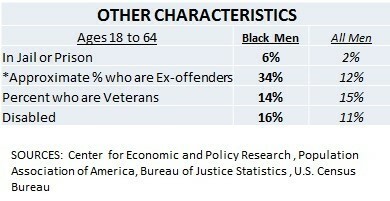 Black men are also slightly more likely to be separated from their spouses (4%) compared to all men at 3%. In addition, Black men are much less likely to outlive their wives and therefore are less likely to be widowed (3%) compared to 10% of ‘all men’. Black men are more likely to be married than Black women. As a matter of fact, there are about 364,000 more Black men who are married than Black women even though Black women are 51% of the Black population. Would you believe it’s not about money. I am a professional Black woman with a salary in the six-figure category and I don’t need or want a man for his money. I want to be a flower in the garden and not compete with XBOX, Facebook etc. What do you think? Don’t be shy. Join the conversation. Scroll down to the bottom of the page and voice your opinions in the “Comments” section. Or, write your own commentary and send it to webmaster@blackmeninamerica.com. Hey Buddy!, I found this information for you: "A Woman’s Point of View on Relationships with Men by Donna Marie". Here is the website link: https://blackmeninamerica.com/a-womans-point-of-view-on-relationships-by-donna-marie/. Thank you.